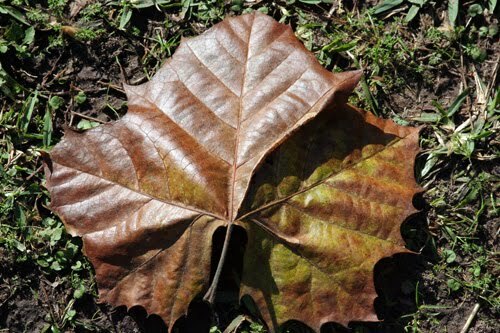 When I walked out to my backyard this morning, I noticed a scattering of yellowed and drying leaves around my sitting area under the sycamore tree. Partly, that is due to the long, dry month that is ending today and, partly, to the changing seasons. Summer is in its last throes, with only three weeks remaining. But this has been a difficult August and it's no surprise that the trees are responding to the stress by dropping some of their leaves early. It has been the hottest August on record in the area. We've had other Augusts that have had more days on which the temperature reached 100 degrees and above, but the difference this year has been that the nights have been so hot. The effect of the greenhouse gases like carbon dioxide and water vapor is to hold heat in and to not allow the earth to cool off at night. (That, after all, is why they are called "greenhouse" gases.) As those gases increase in our atmosphere, the earth will inevitably get hotter. That is why climate scientists warn that future Augusts may be hotter still, because we seem disinclined to do anything about the human-caused part of the greenhouse gas equation. Our answer seems to be to just turn the thermostat down and forget it. Though air conditioning may make our lives bearable, it doesn't do much for the plants and animals outside. They must adapt to the changed conditions or die. One of the ways that plants adapt is to drop their leaves to conserve moisture within the vital roots, trunks and stems. 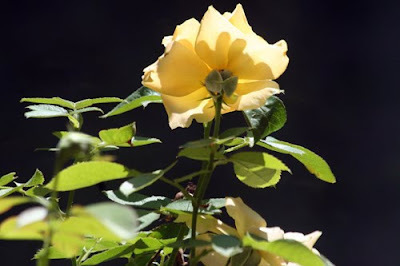 When heat is combined with dry conditions, as has been the case in my yard throughout August, the plants' struggle for survival is made even more difficult. We did actually have plenty of rain in July and that helped a lot but August has been dry, dry, dry, as well as hot, and most of my gardening activities this month have been restricted to wandering the yard with my hose or my watering can in hand or moving the sprinkler from place to place. It seems to have done the trick. At least my plants don't appear to be collapsing in a heap, even if they are shedding leaves. I can't say too much for my poor little fall tomatoes, though. They are alive, but they're just standing there. I don't think they have grown at all since I planted them two-and-a-half weeks ago. Well, tomorrow is September and perhaps it will be kinder to them. And to all of us. Every day now the sun rises a minute or so later and sets a minute or so earlier. It's as if it, too, is tired of this summer and anxious to get it over with. When we went for our walk early this morning the temperature was at 70 degrees and the humidity seemed correspondingly low. It was almost cool! For the first time in...forever, I came home after an hour's walk without my clothes being saturated and dripping salty water. Don't look now, friends, and for goodness' sake don't say it out loud for fear of scaring it away, but autumn is coming. Butterflies, too, especially the Sulphurs, are making their way back into my garden, after a hiatus. Maybe their return has something to do with this. The flame acanthus is back in (almost) full bloom again after I whacked it back severely - was that only two weeks ago? I tell you nothing keeps this plant down for long and it is a magnet for both hummingbirds and butterflies. This Sulphur looks as though it has lighted among tongues of flame. You can certainly see how the plant gets its common name. This Clouded Sulphur enjoyed a nice long snack on this blossom, allowing me to record it for posterity. 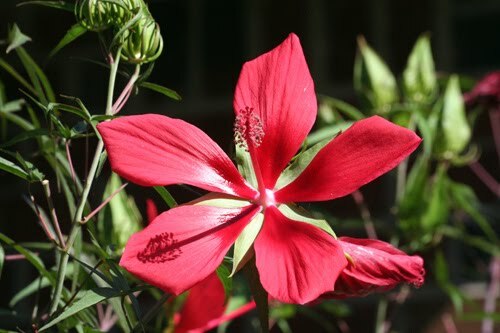 Another butterfly and hummingbird magnet is the Texas Star hibiscus which continues to send out several of its dramatic blossoms every day. 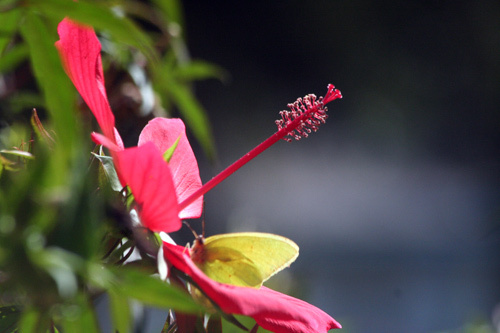 Each blossom is visited many times during the day by both the hummers and the flutterers. The Sulphurs seem to be particularly fond of these blooms. 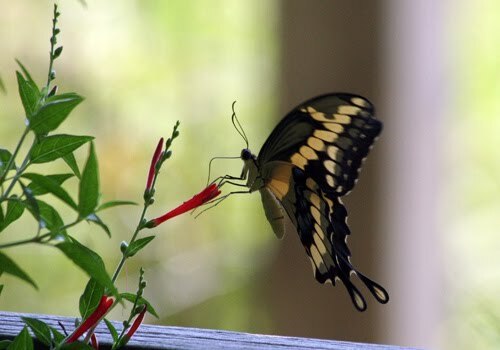 Giant Swallowtails have been present in the garden again, too. I seldom see one of these beauties that hasn't been nicked up in some way - usually one of its swallowtails or part of a hindwing is missing. But this one was absolutely perfect in every way. It had not yet had any close encounters with predators which leads me to believe that it may only recently have emerged from its cocoon. It gave me joy just to see such a perfect and perfectly beautiful creature. 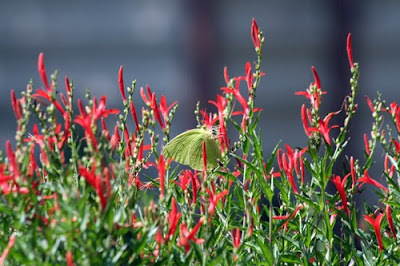 After leaving the flame acanthus, he paid a visit to the nearby butterfly weed. Gulf Fritillaries were highly visible visitors to the garden this week, too. 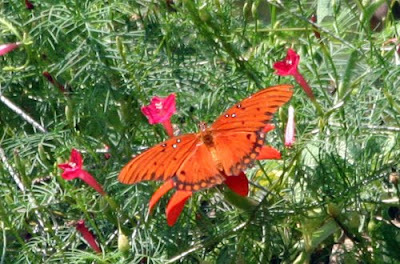 This one is visiting a Mexican sunflower blossom that has poked its way through the cypress vine. This 'Monkey Business' floribunda, seen here with its blossom turned toward the sun and away from me, has been a good performer for me this summer. Likewise this yellow cestrum. Does this thing every stop blooming? It has been in bloom literally since I planted it in the spring and as the plant gets bigger it just puts on more and more blooms. I may have to get another one of these next year. 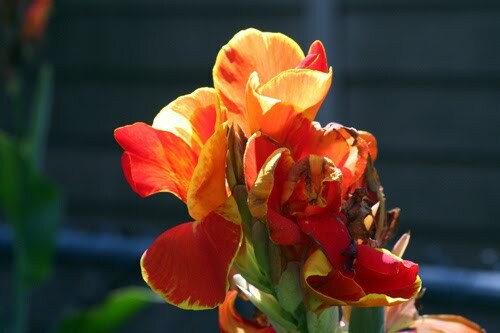 'Lucifer' is again bringing light to my garden. This is his third (I think) flush of blooms. Or maybe fourth. I have to come clean and tell you that I really haven't spent too much time in the garden this week except to do obligatory watering. Yes, I'm still waiting for rain. But whenever I've been out there I have been greatly cheered by the multitude of colorful fliers and a few colorful blooms. All in all, my garden has held up well in the heat of summer and that makes me happy. As a child, I spent a lot of time in solitary wandering around the meadows and pastures of our farm. It was there that I first met many plants that I was to encounter again much later in life and in much changed surroundings. 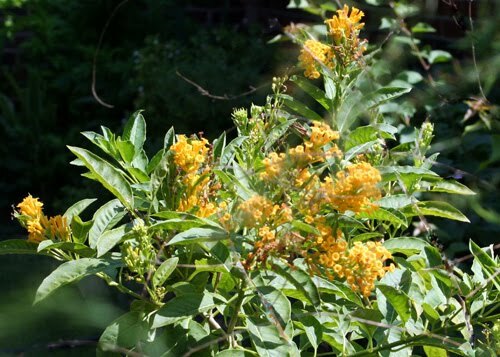 Plants like elderberry, sumac, pokeweed, beautyberry, as well as such wildflowers as butterfly weed, black-eyed Susans, goldenrod, wild roses and asters. There was one weed in particular that fascinated me. We called it jimsonweed. It was a tall shrubby plant, much taller in its full growth than I was at the time. 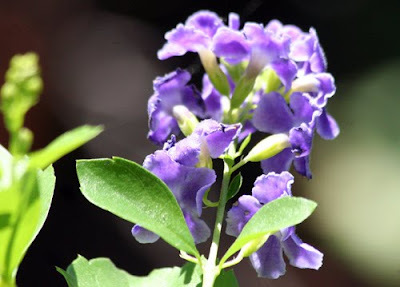 It had large, dramatically-toothed leaves and beautiful trumpet-shaped blossoms that, as I remember, were rather lavender at their base but became bright white through the body of the blossom. The seed pods that formed later were spiky balls. 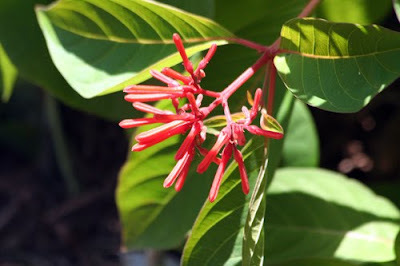 The plant also had a distinctive odor which I can recall but find it hard to describe. It was not unpleasant, necessarily, but on the other hand, it wasn't especially attractive either. I don't remember anyone ever warning me about this plant, but perhaps they did. At any rate, I knew it wasn't something to be trifled with. Its gothic appearance alone might have warned me of that. It was one of many potentially harmful plants in my world. 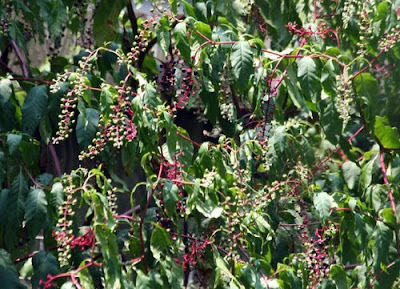 There were plants all around me that could have made me sick or given me some very strange dreams if I had ingested them, but I don't recall ever having any unpleasant experiences with them. I just took them for granted, looked at them, sometimes played with them and watched animals visiting and using their flowers and fruit. It was much later, probably when I was reading Carlos Castaneda in college, that I learned that this plant whose scientific name is Datura stramonium, had psychotropic, narcotic, and hallucinogenic properties. It has been used in shamanism as a bridge to another level of consciousness and it played a role in Castaneda's The Teachings of Don Juan, which was very popular at the time. 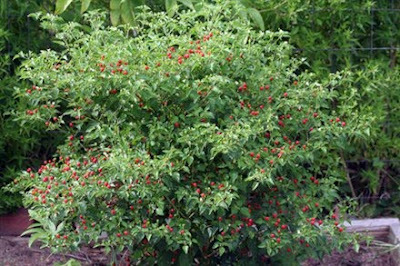 The plant is known locally by many different names. The name by which I knew it, jimsonweed, is actually apparently a corruption of "Jamestown weed." 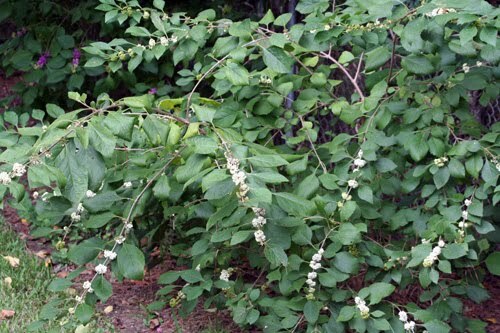 It is also called locoweed, stinkwort, thorn apple (because of its seed pods), mad apple, and devil's trumpet. 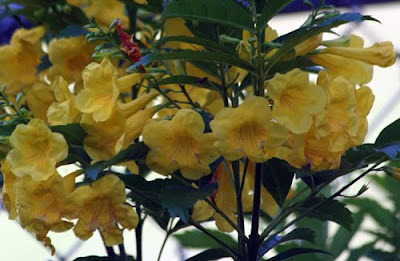 The devil's trumpet is, in fact, related to the plant that is commonly grown in our gardens and called angel's trumpet. 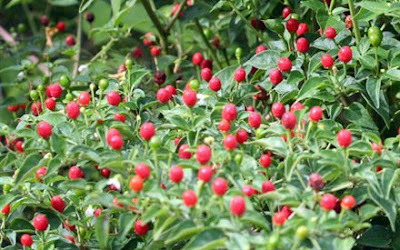 They are both members of the solanaceae family, many of which can be poisonous, but to which some of our favorite veggies like tomatoes and peppers also belong. 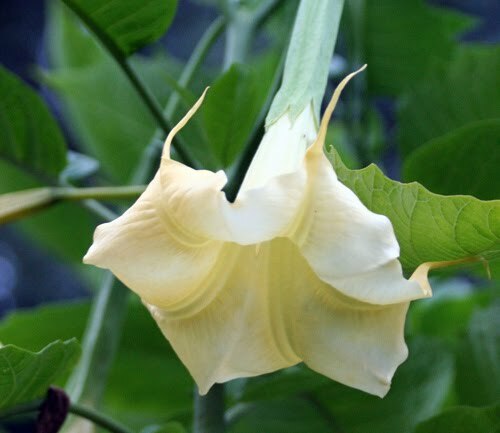 The angel's trumpet also used to carry the name of Datura, but some years ago was rechristened Brugmansia. The two are easily distinguished because angel's trumpet blossoms point down toward the earth while the devil's trumpet is pointed up towards heaven. I was reminded of all this lore about the devil's trumpet when I happened to see a blog post in The New York Times a few days ago. 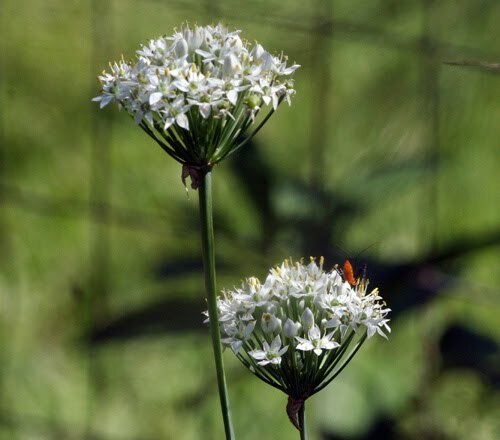 This plant, it seems, grows not just in Southern pastures and meadows but throughout much of the country, including New York City! (Who knew?) 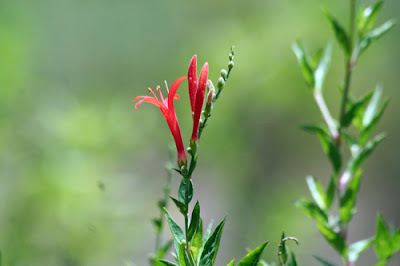 Like many weeds and wildflowers, it is an opportunistic colonizer and will go where the wind or a wild animal takes it and often will make itself at home there. There are several kinds of Datura and some of them are cultivated garden plants. These mostly belong to Datura wrightii, I believe. They are all interesting plants and well worth having in the garden. I've never tried growing one, but I might just look one out for my garden, just for nostalgia's sake. So what if they have an aura of danger? Many of the plants that we grow do. It just brings a little extra fillip of excitement to the staid, bland world of the gardener. Sam Box the backyard box turtle still hasn't revealed herself to me this summer, nor have I again seen the anonymous box turtle visitor that I showed you earlier this month. But look what was waiting for me on my back porch early this morning. Who's that hiding behind the cat food dispenser? Why, it is a baby turtle - clean, shiny, new and not much bigger than a silver dollar. 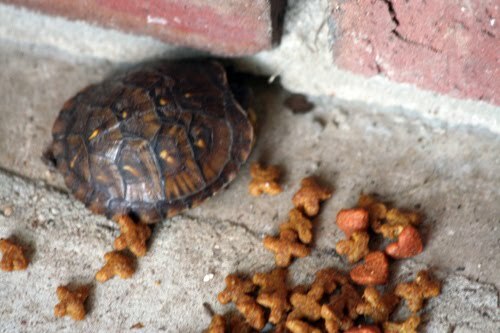 I figured he was there for the cat food so, to make things easier for him, I spread some on the floor. 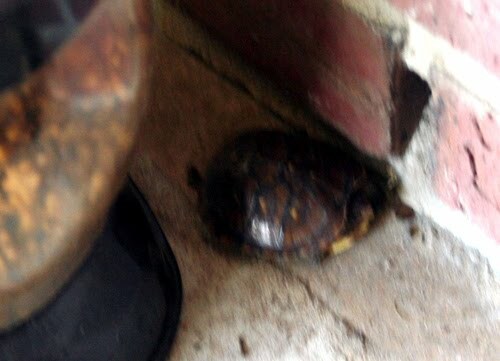 I was hoping he would emerge from his shell and nibble so that I could get a picture of him in action. But as long as I was in the area, even when I hid myself and stood perfectly still, he remained tight in his shell - his mother obviously taught him not to trust strangers. I would call him Son of Sam but that name has already been taken and besmirched so I'll just call him Sammy. What a lovely surprise and a nice way to begin my day. I have remarked before about the abundance of young amphibians and reptiles in the yard this summer. It seems to have been a very good breeding year for them. 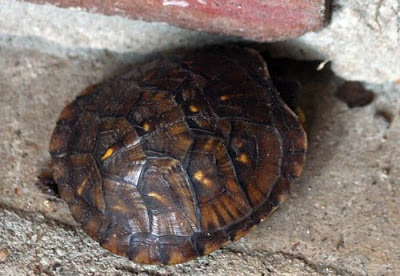 I'm very glad to see that that success extends to box turtles. It's been an interesting but frustrating, hopeful but finally depressing week in the garden. On Monday, we did finally get some of the rain that had been making the rounds in the area. A total of 1.1" fell and was greatly appreciated. Showers continued to flirt with us for much of the week, but ultimately they all passed us by to dump their bounty on some other fortunate plot. Before the rains on Monday, we reached the 100 degree mark for the second time this summer - the first time had been the day before. In fact, we passed it by a smidge, topping out at 101 degrees. Forecasters are saying we might reach the century mark again over the weekend. Sigh. The trees in my yard are beginning to drop some leaves now, most notably the apple tree. It's one way of reducing loss of water in the heat and is just another sign that autumn really is on its way. So what about that fall veggie garden? Well, we did get some replacement tomato plants for the ones we killed a couple of weeks ago. These, too, are 'Champion II' plants and I got the three of them into the ground this week. I dug a big hole for each plant, filled the hole with water, and then stripped off the lower leaves of the plants and buried them with just a few inches showing aboveground. 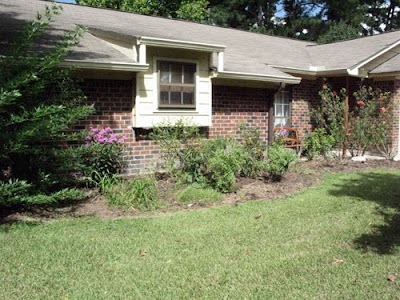 Lastly, I spread a couple of inches of mulch around each plant and watered the mulch and the plant again. Today, I plan to finish mulching the entire bed and put the shade cloth up to give the plants some protection. ...here's all three lined up in the bed. Not much to look at now but I have high hopes for them! Looking around the yard this week, the falling leaves are not the only indication that autumn will soon be here. The fall berries are ripening. As soon as the pokeweed berries turn shiny purple black, they get gobbled up by the birds. Among all the green berries here, you can see a few twigs where the fruit has ripened but most of those have very few berries left on them. 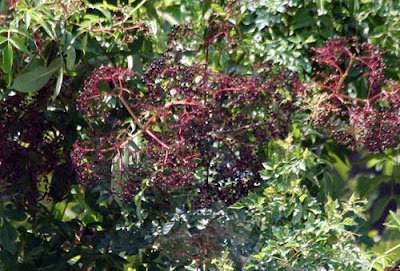 The munching of the elderberries is even more pronounced and, in some places, there are few berries left. I didn't plant the elderberries and pokeweed, the birds did, but I did plant this white beautyberry which is now heavy with berries. Beautyberries typically do not get eaten by the birds until the softer berries like the two above are exhausted. They may last well into the winter. Last year, I was interested to note that the birds seemed to prefer the white beautyberries to the purple ones. The white ones disappeared long before the purple, but I have no explanation for why that should be. Nearby, a purple beautyberry's berries are not quite ripe yet. 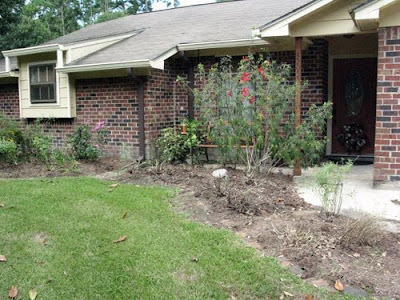 Long-time readers of the blog may remember my documenting my big front yard project last year. On the first of each month, I showed you pictures of the beds there. As a refresher, here's the way they looked on the first of August last year. Here's a view from the driveway, looking toward the entry. Those are Blackfoot daisies that are spilling over. 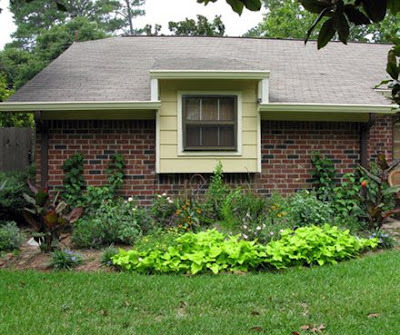 Here's the mid-point of that front bed that was dominated by the rampant potato vine. And here's the view from the south side, looking back across the front. Well, in evaluating the beds during last winter, I decided that I had made just about every mistake in the book, which, truthfully, is just about par for the course of my gardening efforts. Several plants were too big for their space and nearly all the plants went down during the winter (though they came back in spring) leaving the front of the house looking rather drab and forlorn during that season. 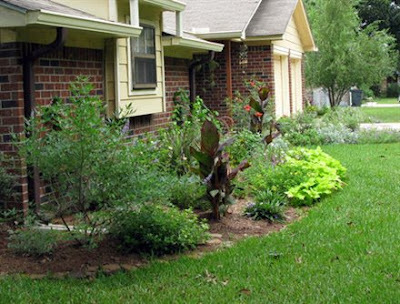 I subsequently moved some of the plants including the 'Big Momma' Turk's caps that obviously wanted more room and the purple fountain grass that was poorly placed. I also moved the 'Tropicannas' to another bed where I thought they might be happier. 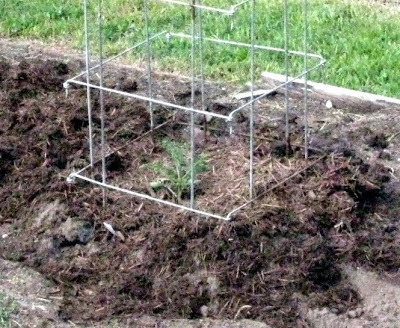 I lost the Australian rosemary and some bat-face cupheas to the winter cold, which was a disappointment. In the spring, I added some viburnums, one of which has done very well, the other two not so well. 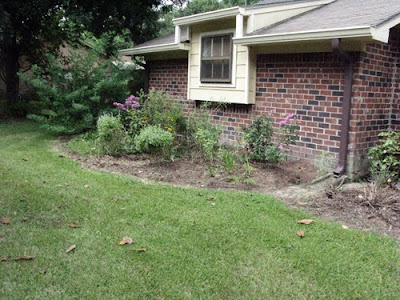 I also shifted some of the other plants around and added some daylilies - just because I needed some place to plant them. And that brings us up to this week. The beds were an overgrown mess. (Sorry, I neglected to take "before" pictures so you'll just have to take my word for that.) Drastic action was called for, so out came the Felcos and I went to work. Here's how the beds looked when I finished. There's not much left at the entry. As for that 'Texas Star' hibiscus, it is now abundantly clear that it, too, needs more room. I'll probably try lifting it and moving it to another location this winter. In the mid-front section, there are some salvias, the viburnums, some phlox and buddleias, but it all looks pretty sad. Looking from the south back across the front is pretty depressing. So, here I go again. I've got my work cut out for me. More research and perhaps professional advice is obviously required. I need some plants that will provide winter interest as well as habitat plants for the birds and butterflies through other seasons of the year. 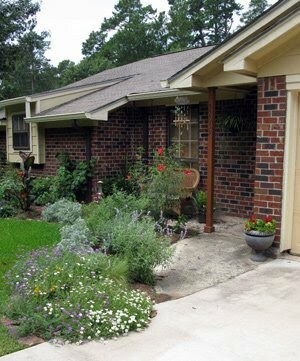 Overall, I still need to achieve that cottage garden look which I like and which goes with the style of my house. At least this time the beds are already in place so I don’t have to start from scratch. Oh, well, another opportunity to learn from my mistakes. 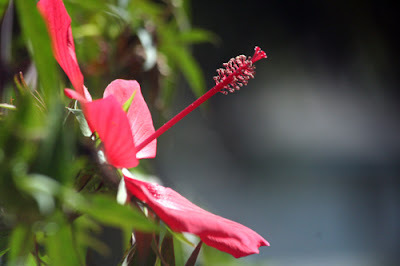 Can you believe that it is Garden Bloggers' Bloom Day again already? Mid-August? Is that even possible? Sigh. The days do tend to fly by when one reaches a certain age. Nevertheless, I know my duty as a garden blogger, so out to the garden I go to show you what is blooming here this hot and dry month. 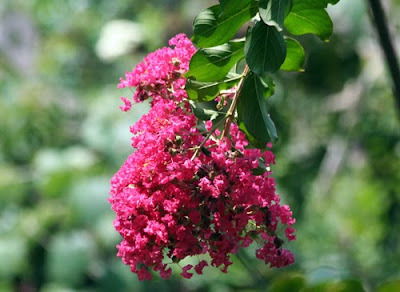 Well, you knew the first thing I would show you would be a crape myrtle, didn't you? These wonderful trees give us these blowsy blossoms all summer long - damn the heat and the drought! And in the winter, the seeds feed the birds. What's not to like? 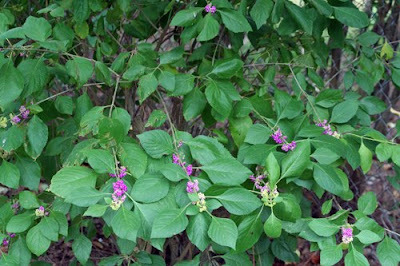 In fact, all the crapes in my yard were planted by the birds from neighbors' trees, so I have no idea what variety this is. The bird didn't tell me. All my durantas died back to the ground during our extra cold winter, but 'Sweet Memory' has come back and is just beginning to bloom. 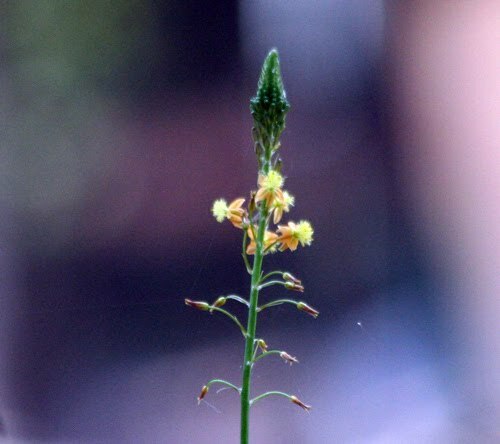 Another plant I thought I had lost to the winter was bulbine, but a few sprigs survived. Now those sprigs have grown and multiplied and they are blooming again. My Hamelia patens seemed late with its blooms this year, but it's finally getting up to speed, and the hummingbirds are grateful. The smaller of my two Esperanzas (Tecoma stans) is blooming its little heart out. The bigger one is growing vegetatively but shows no signs of blooming yet. Another mystery for the gardener. Likewise, one of the Brugmansias is blooming and the other one isn't. But even the one that is blooming isn't blooming as prolifically as it did last year. I suppose it could have something to do with the fact that I moved them during the winter - again. The coral honeysuckle vine has never been without blooms since early spring. 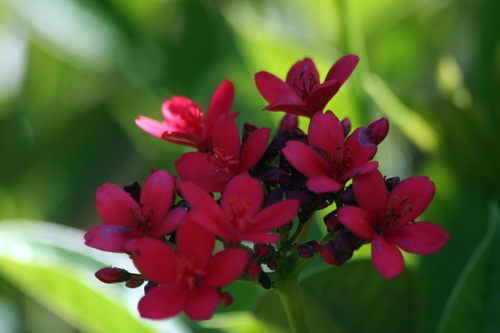 Yes, this is jatropha, another plant I had given up for dead after winter. It had died all the way back to the ground but now has regenerated and is full of these butterfly-inviting blooms. 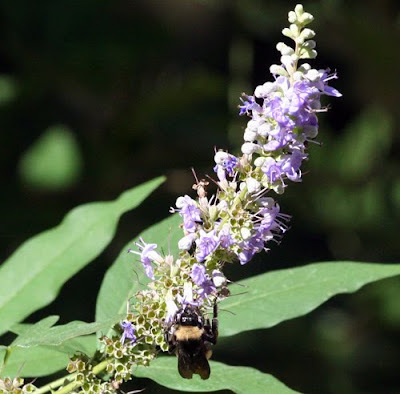 Vitex 'Purple Montrose' is finishing up its second bloom phase of the year. 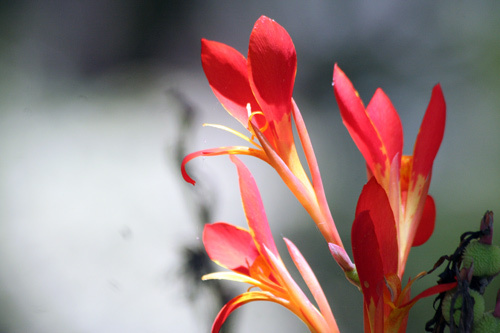 It's hard to find one of its blossoms that doesn't have a bumblebee on it. 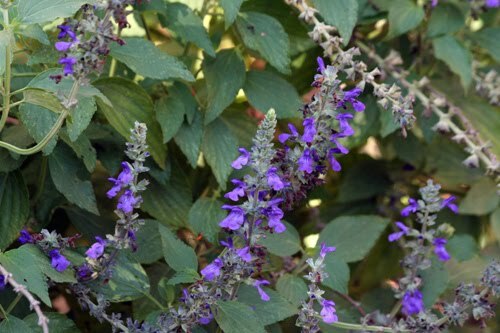 All over the garden, salvias and sages of many kinds bloom on, heedless of the weather. This one, I believe, is 'Indigo spires'. It's not only flowers that are blossoming on the salvias. 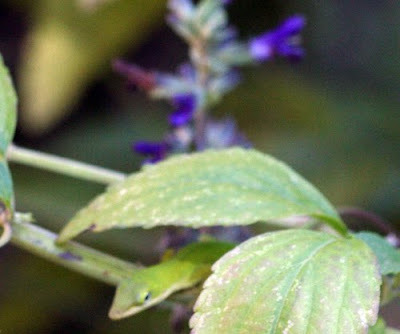 Baby green anoles peek out from the leaves of just about any plant that you look at. 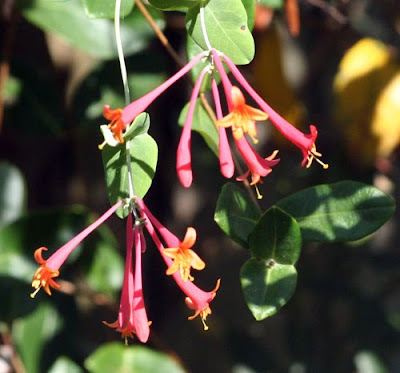 Last week I severely pruned my Anisacanthus wrightii 'Flame acanthus' that had flopped all over the place and I commented that the hedge would be in bloom again within another month. Well, you can lop about three weeks off of that estimate! 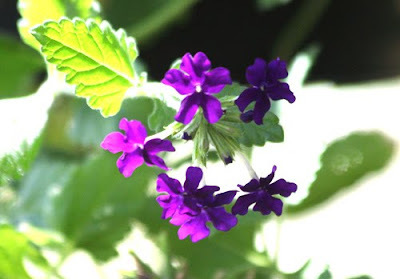 I don't know the name of this purple verbena. It was in a mixed planter that I bought for some quick color in the spring and the variety wasn't identified, but it has been a real winner. It has been in bloom all summer. The 'Texas Star' hibiscus has lived up to its reputation as a prolific bloomer. 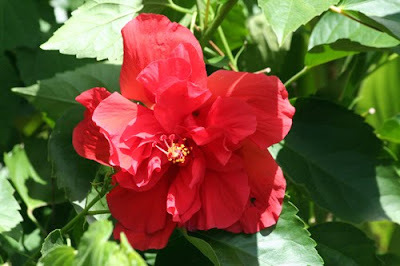 And this mystery hibiscus also has been in bloom since spring and continues to send out two or three of these lovely blossoms every day. 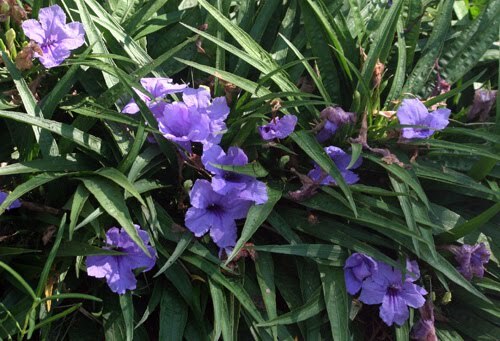 Nothing daunts 'Katie' ruellia for long. She just keeps on truckin'. The same can be said for my old species canna. I don't know its name so I just call it Mrs. Lui after the neighbor that first gave it to me, but it is a winner. It blooms repeatedly throughout spring, summer, and fall, and hummingbirds and butterflies absolutely love it. 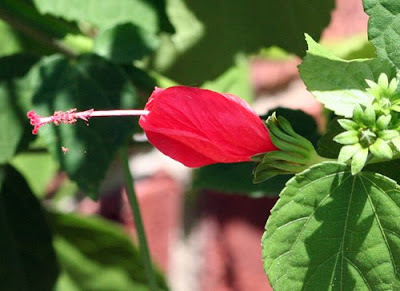 'Turk's cap', of course, is another hummingbird pleaser. 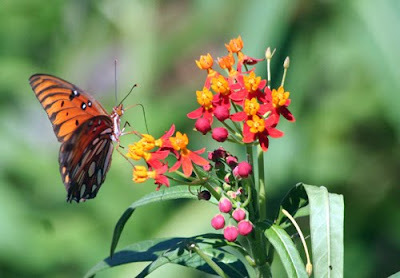 This Gulf Fritillary butterfly doesn't know or care that this butterfly weed was planted to attract Monarchs. When the Monarchs are away, the Fritillaries will happily fill that niche. There's even a passionvine planted nearby for the Fritillary to lay her eggs on once she finishes sipping nectar. So that's my garden tour for the month. I heard on the radio earlier that the heat index today may be up to 119 degrees Fahrenheit, so you'll forgive me if I head indoors where it's cool. 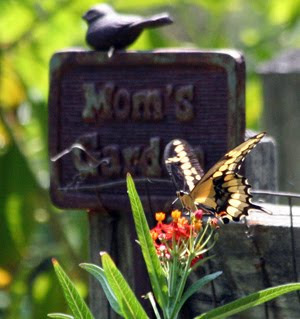 Why don't you mosey on over to Carol's May Dreams Gardens and check out some of the other gardens participating in this month's Bloom Day? Happy Friday the thirteenth! You're not superstitious, are you? After all, a Friday is still a Friday even if it is the thirteenth and that means the beginning of the weekend, always a happy time. I found reason to be happy very early this morning. When I first went outside, I noticed a freshness in the air, almost a briskness. Of course, that didn't last long. It heated up pretty quickly, but for just a little while, I could almost feel fall in the air. Later, around mid-day as I was taking a break on one of the chairs in my backyard, I looked up at the sky with its fluffy marshmallow clouds and I realized that the sky had changed over the last few days when I wasn't looking. The color was different. It was a deeper and brighter blue, almost but not quite an autumn blue. Yes, and the angle of the sun HAS changed and with it the shadows in my yard. All these things are harbingers of the change in seasons to come. This week we passed the mid-point of summer (at least as it appears on the calendar). It's all downhill from here! Autumn is a comin'. 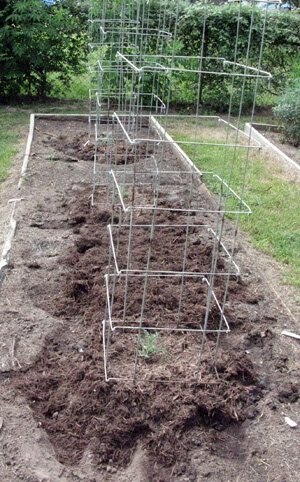 With autumn on its way, it is time to get that fall veggie garden under way. 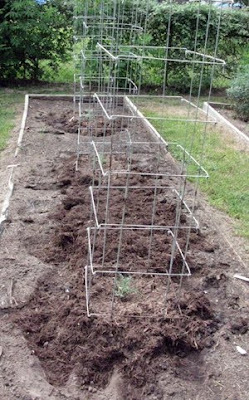 I haven't yet replaced my unfortunate tomato plants that I told you about last Friday, but we did get some screening this week that will both provide shade and maybe keep out some of the insects. I hope to get some more plants this weekend. From the spring veggie garden, my eggplants and peppers are still producing. They just laugh at the heat. 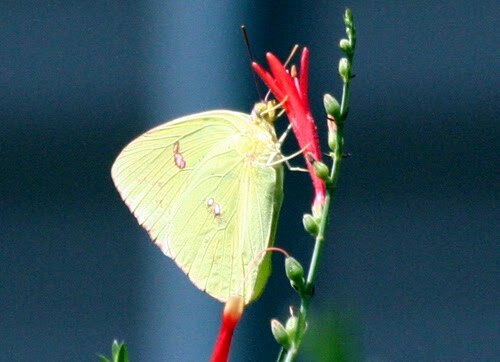 In looking at my garden journal entries from last year and also my blog entries, I have realized that my butterfly population seems quite a bit less this summer than last. 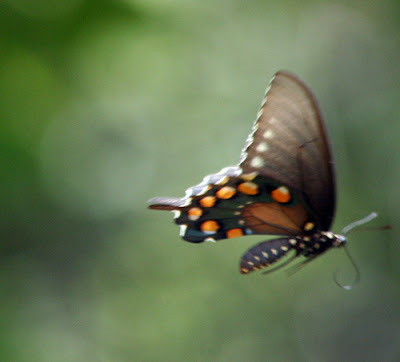 At this time last year, I was seeing a great variety of Swallowtails, as well as Sulphurs, Monarchs, Skippers, Gulf Fritillaries and the occasional Buckeye. This week, I can just about count on the fingers of one hand the butterflies that I have seen - a Sulphur, a Pipe-vine Swallowtail, a Giant Swallowtail, and that is about it. Suddenly, my yard seems almost butterfly-free. It's been weeks since I've seen a Monarch here, but I do have several butterfly weeds that are all ready for them if they should show up. 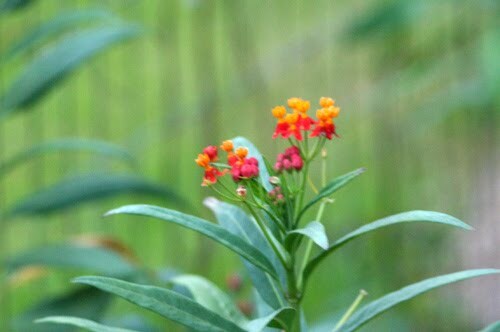 Asclepias curassavica, in bloom and waiting. And they should be showing up in the next few weeks. The Monarch fall migration has started or is just about to start in the north and these fragile but tough beauties will be winging their way south to us on their way to Mexico. If you don't have butterfly weed in your garden, now is the time to get it planted and growing for them, so they will have a place to lay their eggs that will become the next generation of butterflies. Though I haven't seen many butterflies this week, the yard is full of wildlife. There are many, many baby anoles, toads, and frogs around. I'm almost afraid to take a step in some places of the yard for fear I might snuff out the life of one of them. I was hand watering some plants today when the tiniest anole I have ever seen jumped from the plant to the fence behind it. It was literally no bigger than the first knuckle of my little finger. It must have just come from the egg. As always, there are plenty of birds in the yard, although most of them are pretty quiet during this season. In addition to the birds, there is some wildlife that I have with me at all seasons. 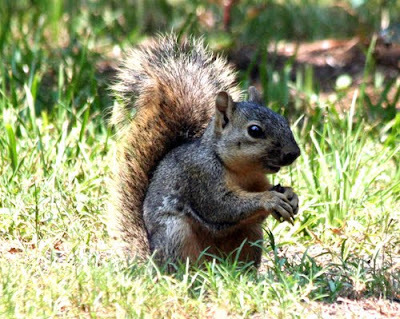 One of several squirrels that take their lunch under my birdfeeders every day. I've heard tell that for some gardeners the only good squirrel is a dead squirrel, but they don't do any damage in my yard, maybe because there's always plenty of birdseed lying around for them to scavenge. For me, they are just part of the entertainment of another week in the garden.